Many overseas dental treatments providers are agents, which means you are a commodity brokered for a profit. Not that there is anything wrong with profit but what happens if something does go wrong? 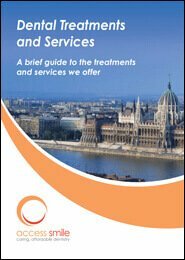 Access Smile clinics are wholly owned and managed by Access Smile, this is why the level of aftercare support is unsurpassed and beyond that of any other dentist practice we know either in Hungary or the UK. I'd had an estimate in Britain of 8 hours and £1,000 for just one tooth. The dentist in Budapest did the preparation work on 19 teeth in six and a half hours and the whole thing, including the most expensive crowns available (which are metal-free and therefore look like real teeth) cost around £4,000. The most impressive thing was that because the dentist was so gentle and sympathetic, six and a half hours in the dentist's chair really wasn't that bad. The fact that Access Smile then drove me back to where I was staying (and ferried me back and forth to all subsequent appointments) really made a huge difference. I am so glad I went. My partner is planning to go too! On arrival at the clinic, the high quality of the premises and the high-tech scanning X-ray equipment immediately dispelled any remaining fears that this might be a "budget" operation. My dentist was extremely competent and professional. I was impressed that she was willing to work until 7:00pm in order finish my preparation work in a single session. The customer service staff were also very helpful.